Hope everyone has had a Marvelous Monday! Mine has not been marvelous per se...but not bad! I wasn't able to meet with my buddies tonight! I have a group of stamping and scrap booking friends that gather together every Monday night! Sometimes we stamp and sometimes we just visit! But due to a "mini" family crisis I wasn't able to see my buds tonight! 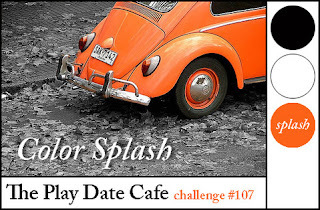 It's 'Color Splash' Week in The Cafe. This card was made entirely with Verve stamp sets, (which I'll list below). I love my Verve stamps!!!!!! I made a coil of black jewelry wire around the orange ribbon on the tag. The black Jumbo Ric Rac die cut (MFT) was also embossed with the Cuttlebug Swiss Dots folder. This is delightful Mackie! Love the chunky button and the PRETTyY bit of orange ribbon!!! What a lovely mix of black, white, and that splash of orange! Beautiful card! Awesome splash! Love the whimsy of it :) Thanks for playing at The Play Date Cafe!